We live in a drop-in house. I know some people hate drop-in visits. I love them. They remind me of college, four happy years of back-to-back unexpected visitors. It helps that I'm not embarrassed by the mess that is my house. I assume friends will understand the Not Ketchup chaos. I'll clean up when I'm a millionaire. This past Saturday morning our friends G and N popped in during their morning walk around the neighborhood. We chatted over coffee and pomegranates until I had to rush out to a meeting. What would I have done with that half-hour had they not stopped by? Nothing as interesting as visiting with them, I'm sure. My neighbor S comes by with her toddlers, too. The last time they came down to my office, unfortunately, I was on a call and couldn't stop to play. But most of the time I am delighted for a few minutes of kid time. I feed people when they drop in. These falafel stuffed mushrooms are the perfect snack for drop-in visitors: They're easy, quick, healthy and delicious. Note: Look for prepared falafel mix in the ethnic section of major grocery stores or in Middle Eastern markets. The recipe states 55 minutes total, but the first half hour is mostly waiting for the falafel mix to be ready to scoop and the rest is baking time, so you have plenty of time to visit with your guests. This vegan snack is easy, fast, healthy and delicious. Using boxed falafel mix makes preparation even quicker. Preheat the oven to 350 degrees.In a small mixing bowl, combine the falafel mix and water. Stir to combine, then let rest at room temperature 30-60 minutes.While the falafel mixture is resting, wash the mushrooms and remove the stems. Pat the mushroom caps dry with paper towels.Pour 2 Tablespoons of olive oil into a baking dish and swirl to coat the bottom. Add the mushrooms to the dish and turn them over with your hands, making sure the mushrooms are coated with the oil. Sprinkle the mushroom caps with salt.Using a small spoon, scoop out about 1 Tablespoon of the falafel mixture and mound it into a mushroom cap, smoothing the top with the back of the spoon or your fingers. Repeat with the remaining falafel mixture and mushroom caps. 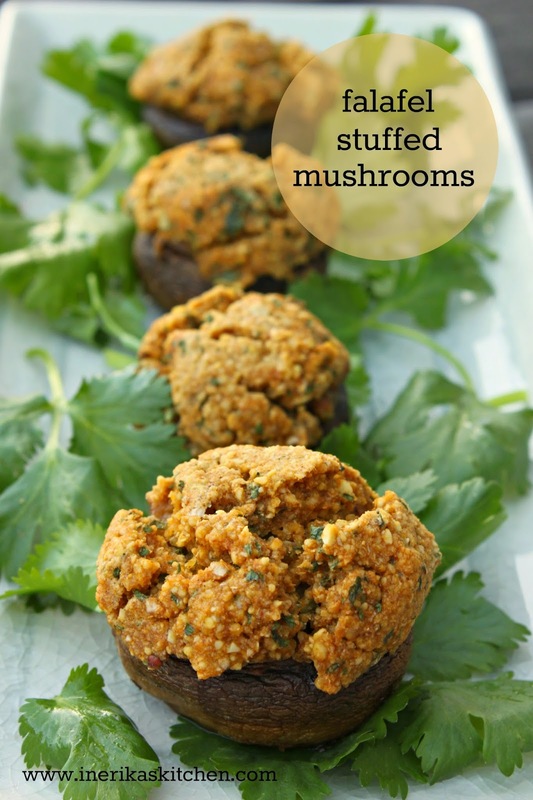 Drizzle the remaining 1 Tablespoon olive oil over the tops of the stuffed mushrooms.Bake the mushrooms about 25 minutes, until the mushrooms are tender and the falafel is cooked through and golden brown on top. Drizzle with the tahini if desired and serve warm. I dunno what tahini sauce is though....is it just thinned tahini (and what should I thin it with? or is it a jarred product? LOVE THIS! Might have to put a dab of Not Ketchup on them to try that out! @Dorothy yes, sorry, I just drizzled over a bit of straight tahini from the jar. I will clarify in the recipe. Thanks for pointing it out.